I’ve had Fid for about 10 months. He has grown about two feet and has only lost a few leaves in the beginning ( I believe from not enough water). Recently we moved and have, what I believe is the perfect space for him. He’ gets sunlight throughout the day, I water him once a week with spring water ( about 1/2 gallon or just under). I dust him off every couple months with paper towel and water. Just this week, I’ve noticed a few leaves turning yellow. I’m not sure if I’m watering too much, if I need to repot him ( still in the pot I got him in), or if he’s getting too much light. Also, was wondering if there is anything I could use to make his leaves a little shinier? 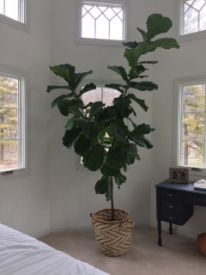 Your Ficus lyrata is very healthy and has been well cared for by you. I don’t recommend that you change much of anything. 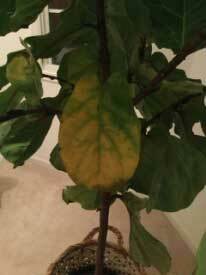 The lower leaf yellowing is normal. New growth leaves get added at the tip ends of the stems. As more leaves get added above, some older leaves will yellow and die. This is because the plant can support only a limited number of leaves at one time. Over time, the stems will grow ever taller and there will be fewer leaves at the bottom. The only remedy for that is pruning. You already have one stem that is much taller than the others. I suggest that you consider pruning off the top 2-3 feet of that stem. That will make the plant shorter, more compact and symmetrical. It will also discourage more lower leaf loss. An alternative is to pinch out new leaves as they emerge on the tallest stems. This will keep those stems from getting any taller and discourage lower leaf loss. I know that pruning and pinching are hard for people to do because they feel like it is hurting the plant. It does not. It it like getting a haircut – it does not affect your health, but it does alter your appearance. It is an aesthetic decision. The light you have in that location is good, but it is by no means too much nor the cause of leaf yellowing. There is no reason to repot your Ficus. It can stay in that pot indefinitely. Keeping it tightly potted in the nursery pot will make over watering very unlikely. If you find that the soil surface dries out in less than a week, you may need to water a bit more frequently. Because your plant is so healthy, I do not recommend any major changes in your watering routine. To make the leaves shinier, dilute some mineral oil with water and wipe it into the top surfaces of the leaves. Alter the dilution to get the degree of shininess that you like while avoiding making it feel greasy.